Before beginning preheat the oven to 450 degrees. 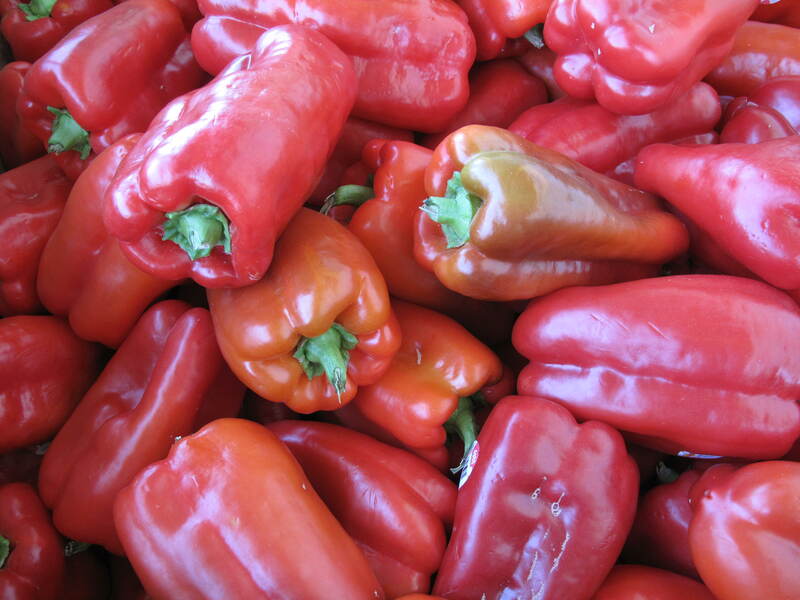 On a baking sheet place the 4 bell peppers, cut side up and lightly sprinkle them with olive oil. Place the garlic among peppers evenly. Season with oregano, salt, and pepper. Roast in oven until pepper’s flesh is tender and the skin is blistered in spots, (about 35 mins). Plave peppers on a platter and top with a small handful of the fresh basil. 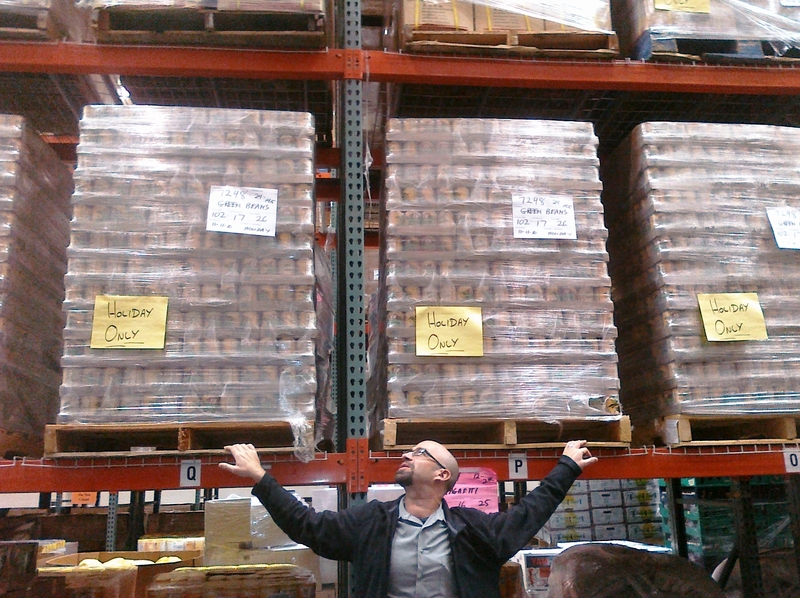 Warehouse crew hops to it, distributing 108,000 eggs for Easter! Our warehouse is really hopping! 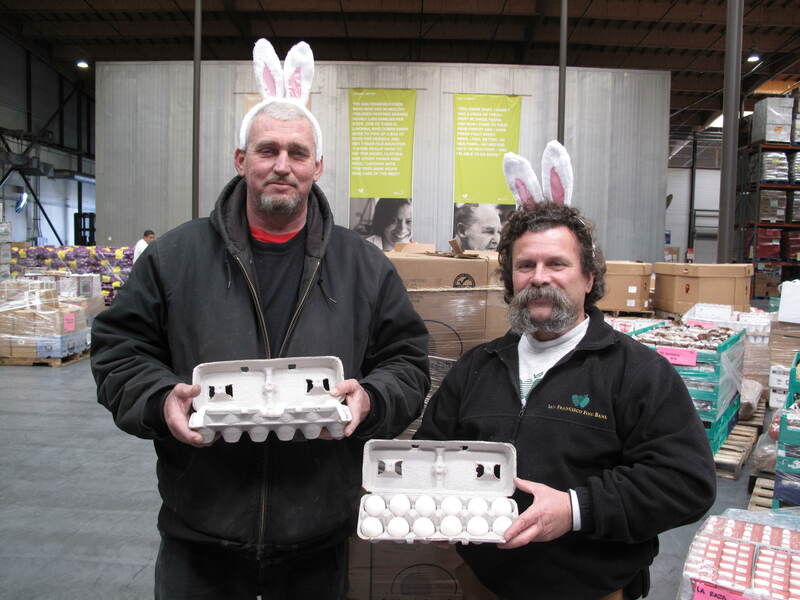 Dave & Al helped move 108,000 eggs out to needy families for Easter. Got a donation of products or cash that would help make a hungry family’s holiday? We’re all ears!! 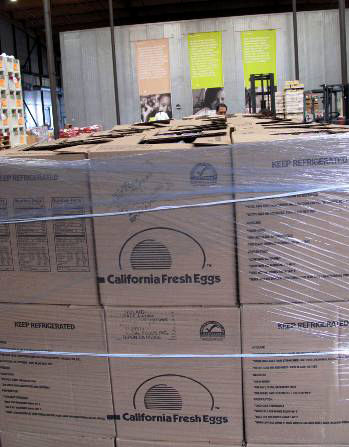 Today, the San Francisco Food Bank received 88,650 eggs just in time for Easter from NuCal Foods. They were all sourced locally from a farm in Petaluma, CA. 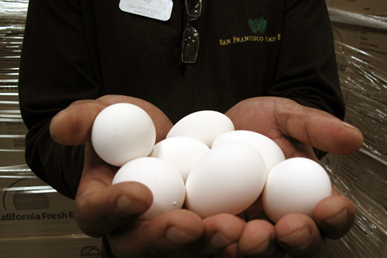 Fresh eggs are always a prized item for Food Banks due to their dense nutritional and high protein content. And they’re one of the hardest food categories for food banks to acquire. The eggs we got were slightly smaller in size than what’s generally considered most desirable by consumers. But wggs of any size are very popular out at our pantries. We recently spoke to an unemployed nanny at a pantry in the Bayview who told us that her kids love to eat eggs for breakfast. 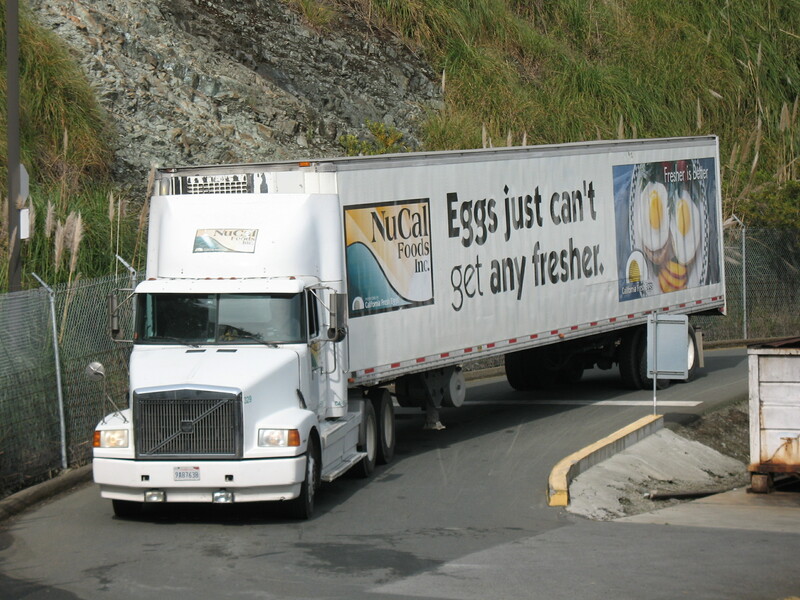 This donation of over 7,000 dozen eggs from NuCal will help to feed the 1 in 4 children and 1 in 5 adults at risk of hunger in San Francisco. They’ve already been sent out to our pantries, including senior centers and community centers serving large families. 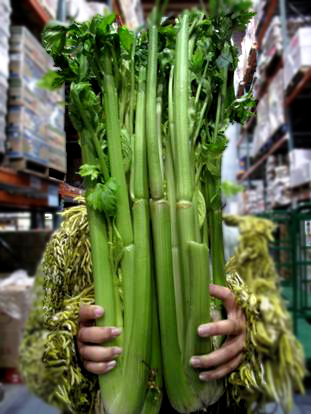 Here’s something you won’t see at the supermarket: a thicket of giant celery! Its size may render it unmarketable – but it’s still perfectly fresh, perfectly good and ready to go out to our pantries. Many people still associate canned and dry foods with food banks. And while we still have staple foods like pasta, rice and beans on hand, it’s actually fresh fruits and vegetables like this celery that make up the bulk of what we distribute. Bike Riders Bring in 7,507 Pounds of Food! We’re used to having big tractor-trailer trucks roll up to the San Francisco Food Bank’s loading dock – that’s how most of the 36.5 million pounds of food moving through our warehouse this year will arrive. But last Saturday, 7,507 pounds of food showed up on some very different wheels – bicycles! It was thanks to the 4th Annual Supermarket Street Sweep, a competition that challenges bike riders to collect and deliver food to our warehouse. One hundred ninety-eight riders participated this year, and they topped the total food collected at last year’s event by more than a ton! There were prizes for the fastest racers to collect a list of required items from various grocery stores (with the receipts to prove it) and prizes for bikers who showed up with the weightiest loads of food. This year’s biggest haul – a whopping 962 pounds – was pedaled in by a single rider pulling a trailer. You can see him in action, along with the other racers, in the video up above. Many thanks to the event organizers and all the participants, who provided enough food for nearly 6,000 meals! If you’re interested in joining the Supermarket Street Sweep next year, you’ll find more information here. And you can see a gallery of photos from Saturday’s event here. Today’s Fruit of the Day – Grapes! 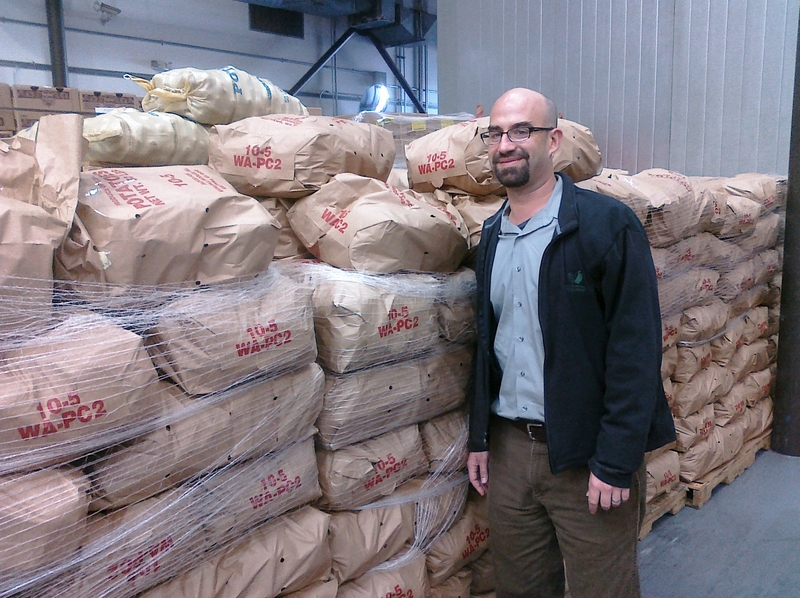 1,980 cases of grapes came in today thanks to the Farm to Family program and SunWorld packers! That’s 15,840 bags of sweet, seedless grapes. 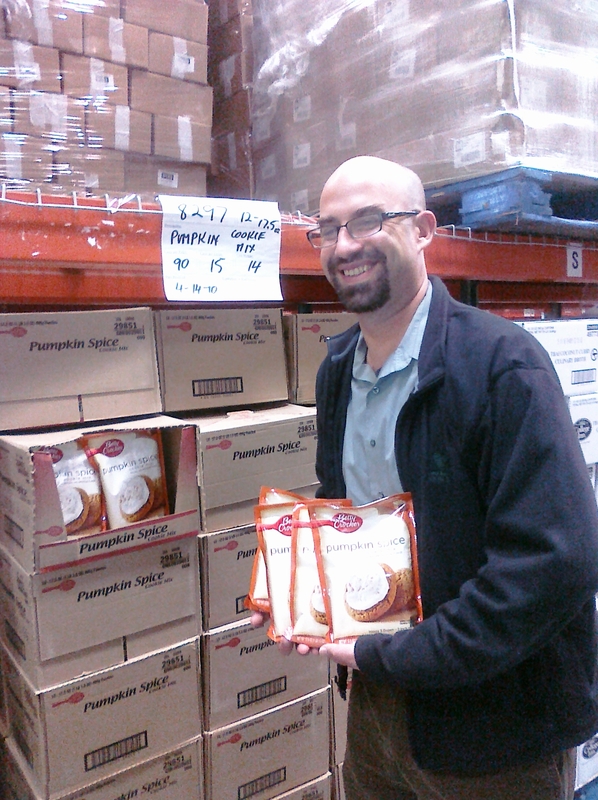 Here they are in our cooler – 22 pallets, all tagged for delivery to a neighborhood pantry.